It's that time of year again my lovelies: New York Fashion Week! I love to see all of my favorite designers and thoroughly enjoy their collections for the upcoming season. I've been staying at a hotel in frigid New York since Thursday morning with one of my favorite blogger babes. This is my first time attending New York Fashion Week with so many shows back to back, word to Drake. I was incredibly fortunate to have so many shows and I can honestly say it has been so much fun and I'm super grateful to have gotten the opportunity. The weather has been so crazy in NYC and I've had to improvise on so many outfits. I don't know if any of you have ever been to NYFW, but I tried hard to plan my outfits so they can sync with the show I was seeing but the weather was making me do otherwise. The first day, which was the day we drove in from DC, I had the Desigual show and there was a crazy snow storm that hit NYC as we were driving in. We arrived later than what we wanted due to the inclement weather but we made it just in time for the show! For my look I tried to bundle up as much as I could, while being equally stylish. Guys, you know how difficult it is to be functionally warm and stylishly hot!? The closer we got to New York the more snow we saw so I went with a functional and layered look; I decided to use my faux fur vest as another layer on top of my black peacoat. The hat, an excellent winter accessory that everyone should have in their klosets, was a great addition to the look and really helped me out weather wise. I'm, also, really glad I brought these booties with me. They have probably been in almost all of my looks because of the weather here. I also added a fringe purse into the mix. Desigual is one of my favorite brands because the looks are always diverse and really edgy. The show had a floral runway and featured the 2017 Fall/Winter collection. I fell in love with so many pieces. They varied from animal prints to geometric lines and from lace to leather. There was also a really fun mix of vivid colors with colorful tights. There were also a lot of fishnet stockings on the runway; I for one thought the trend would phase out quickly, but based on the usage by Desigual it is pretty clear that trend is staying for a while. I have no problem with that! One of the best things about the collection was where it got its inspiration from. The collection was inspired by the female uprisings of the 60s, 70s, and 80s and reinterpreted for the women of today. I always feel that the best designs are able to collaborate with their tailors to create a sartorial tapestry that maybe wouldn't exist otherwise. Tell me a story with your designs. Desigual did exactly that, which I thought that was pretty cool. 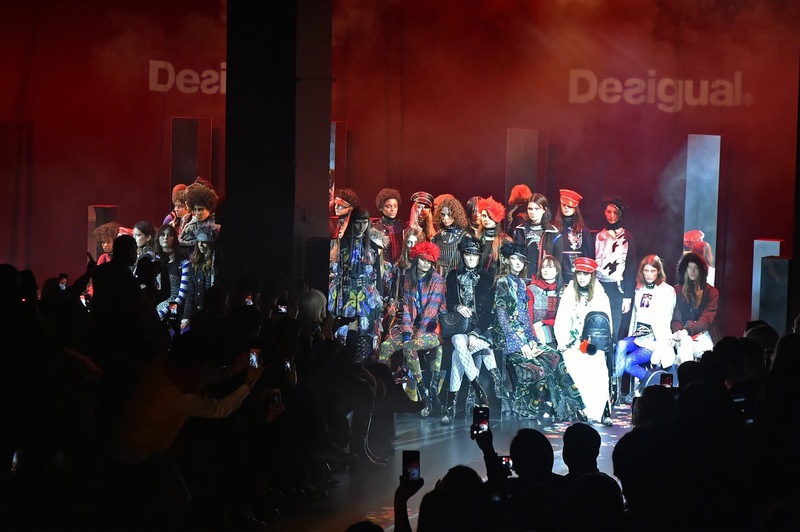 The music selections, the revolutionary vibe, and the innovative looks were all amazing! Here's some of my favorite looks from the show. Which ones are your favorite? Please comment below. Hope you guys enjoyed this post. There's more NYFW posts coming this week of both my looks and all the shows, so make sure you come back to my kloset for all the details! I love that the snow was just a part of your shoot here! Just roll with it! Hope you have fun at NYFW! Thank you so much love! It's an amazing experience. Love your outfit and how stunning you are looking. Pics are gorgeous and love the way you explained The Show.I can feel the vibe.